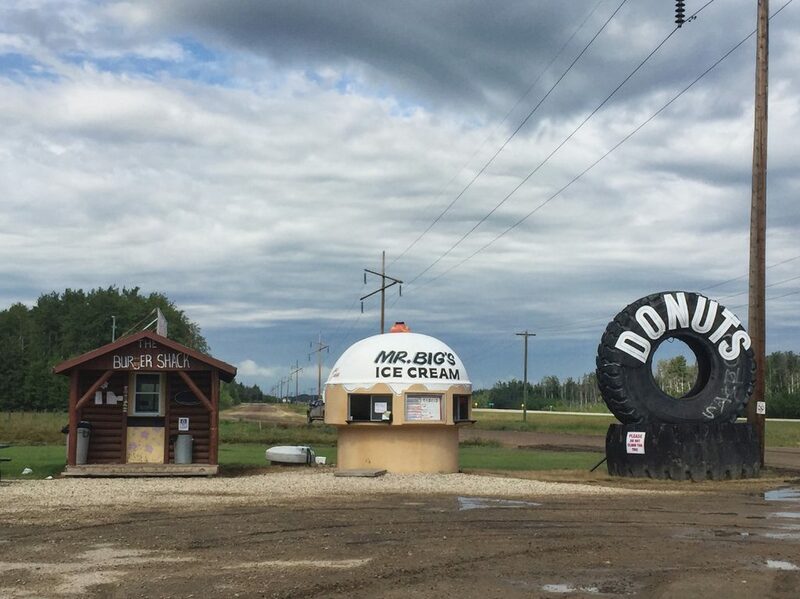 This summer, I hit the road with the Alberta Motor Association and my friend Diane, to explore Grande Prairie in northern Alberta as part of AMA’s ‘The Road is Calling’ summer campaign. The Road is Calling encourages Albertans to visit attractions across the province and share adventures using the hashtag #TheRoadisCalling. AMA is even running a #TheRoadIsCalling contest you can enter for a chance to win a prize valued at $9,000! I’ve been pushing the provincial “Explore Alberta staycation” all summer (with trips to Calgary, on the Alberta Prairie Railway, and to Sylvan Lake) so this Grande Prairie exploration really fit. From Edmonton, Grande Prairie is about a 4-and-a-half hour drive away. It’s definitely do-able as a weekend getaway (I’m getting pretty good at these whirlwind, weekend getaway staycations). 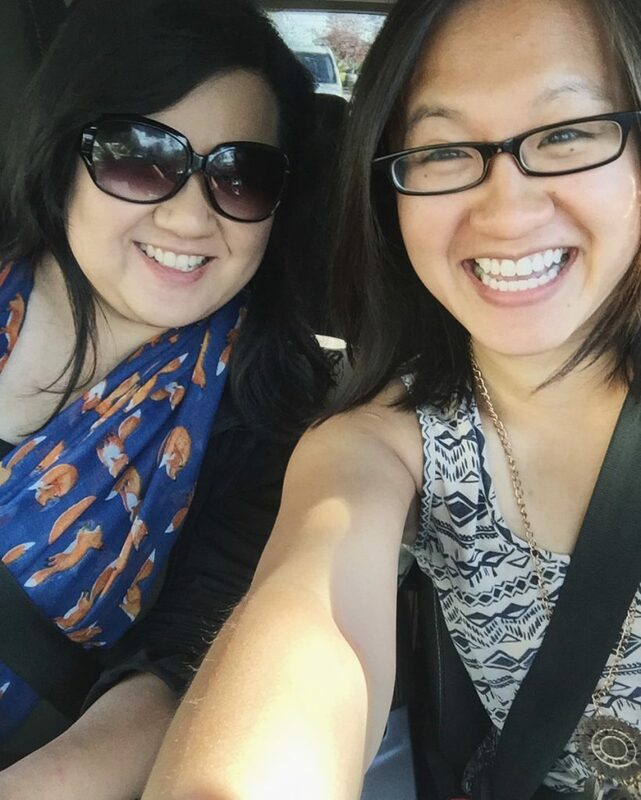 We had so much fun exploring and eating our way through GP (and surrounding area)! Seat belts – check. Pre-road-trip selfie – check! Diane and I about to hit the road to Grande Prairie! 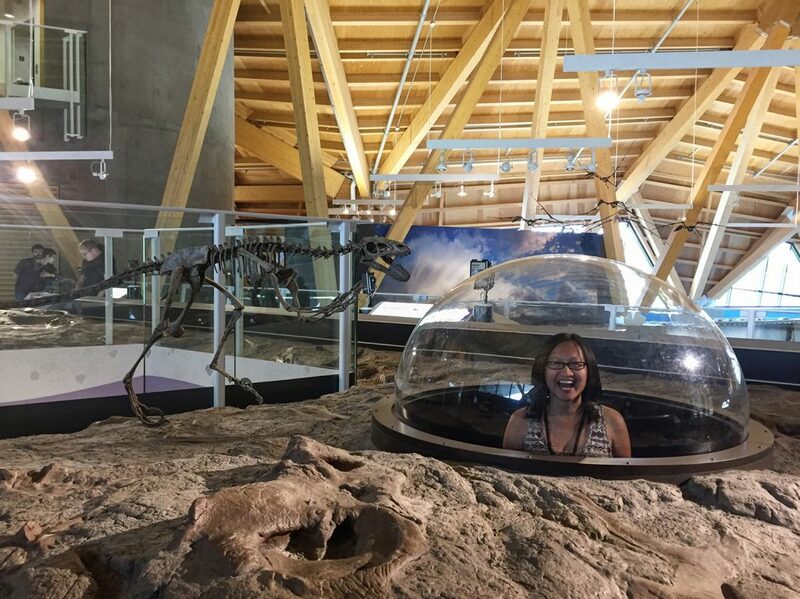 Here’s my recap and recommendations on things you should do when you visit Grande Prairie (including must-stops on the way to and from the city)! And be sure to head over to AMA and enter their #TheRoadIsCalling contest for a chance to win a prize valued at $9,000! At the Philip J. Currie Dinosaur Museum! 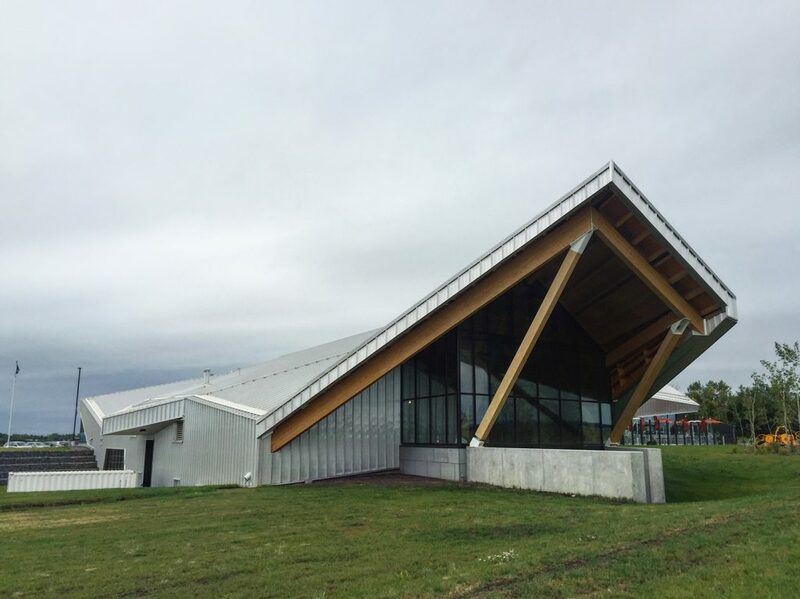 A new-ish attraction to the Grande Prairie area is the Philip J. Currie Dinosaur Museum – basically the Royal Tyrrell Museum of the North. 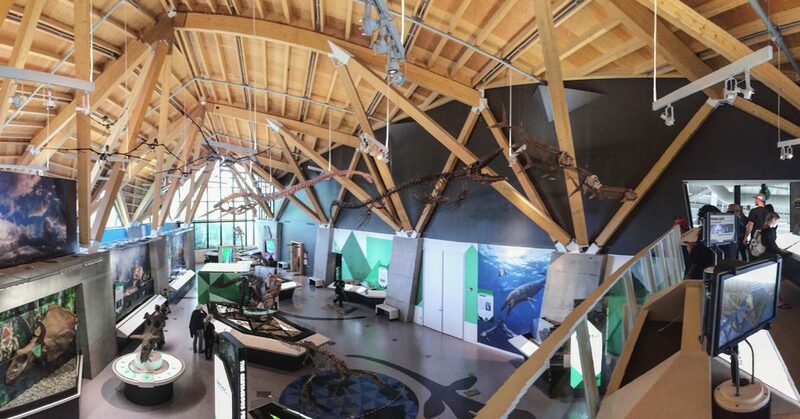 This beautiful museum opened September 2015 and features various dino galleries, a theatre, research/collection areas, a huge outdoor bone bed where you can go on a 2-hour discovery fossil walk. Inside the Philip J. Currie Dinosaur Museum. I loved how interactive the museum was. It featured these really cool augmented reality screens that you could use to learn about the different dinosaurs displayed in the museum. There were different computer games highlighting dino facts, animated dinosaurs and videos playing throughout the space, dials you can spin around to line up dinosaur outlines with its proper species, and more. Lots of interactive features at the Philip J. Currie Dinosaur Museum. They really encourage visitors to touch – read – interact. 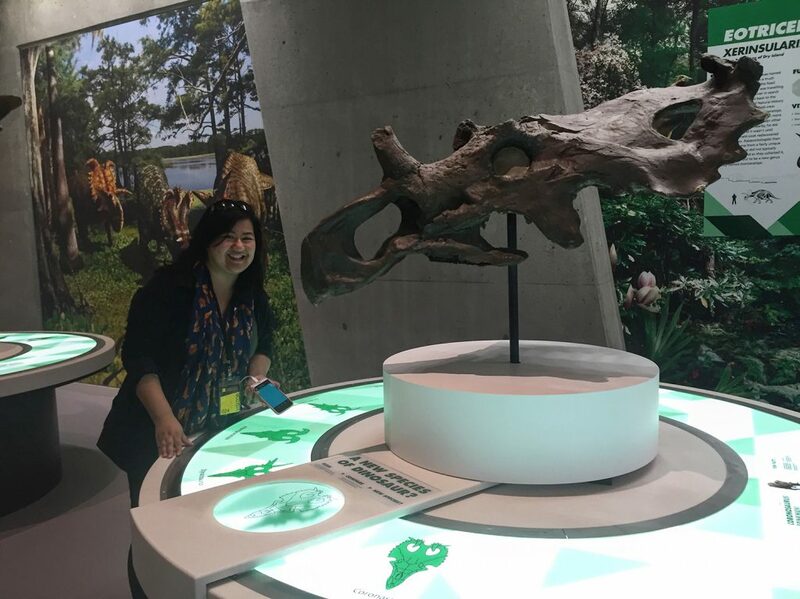 The museum isn’t as big as the Royal Tyrrell in Drumheller but it’s an awesome facility – a great addition to this part of Alberta! The bone bed walking tour is a great feature too, even though we didn’t have time to do it (it’s a 2-hour investment, so be sure to include that time in your GP getaway planning! At $5 additional dollars, I think it would really add to the museum experience. Interactive exhibit at the Philip J. Currie Dinosaur Museum. I’m excited to see how dino-(paleo)-tourism grows in this year over the next few years. The Philip J. Currie Museum has only been open a year and is already getting great praise – named one of the 10 biggest museum openings of the year in Conde Nast Traveler. I was excited to see how busy the museum was when we went – there were consistent line-ups at the front to get in and lots of families! Amazing tacos from El Norteno at the Grande Prairie Farmer’s Market. When visiting – anywhere – I try to squeeze in as many meals as possible. I applied this same mentality to my 1.5 days in Grande Prairie. 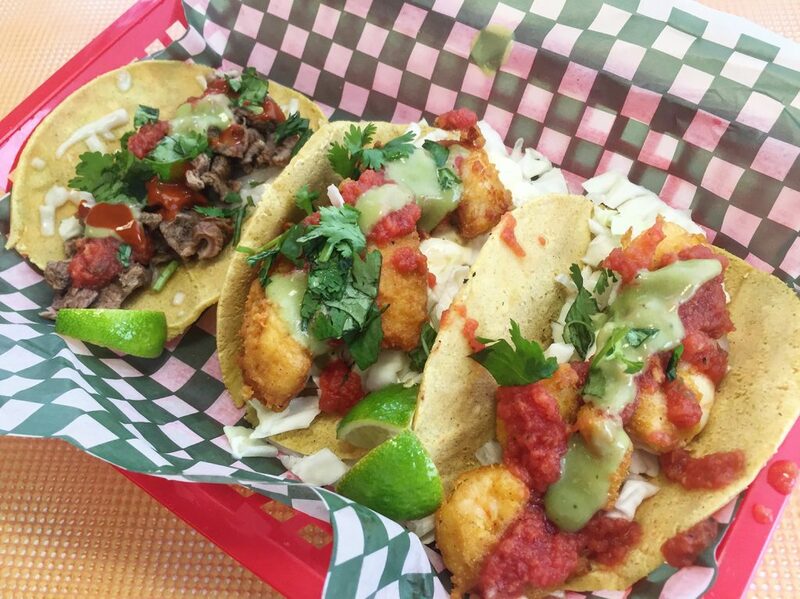 El Norteno is a small taco stand located inside the Grande Prairie Farmer’s Market – and its fish and shrimp tacos are amazing! The freshly-made (right before your eyes) tortillas have a great texture to them and the fish/shrimp is full of flavour. Go for the tacos but also check out the great vendors inside the market. 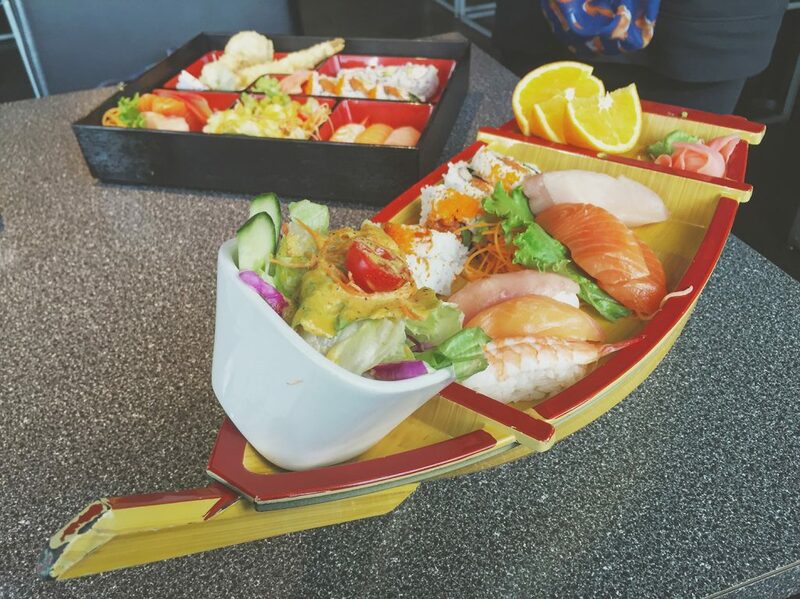 Delicious sushi and sashimi bento box and boat at Soto Japanese. Padrino’s Restaurant has a great feature page of dishes featuring local produce and proteins which I thought was really cool. Bison are indigenous to Alberta and they featured a lot of bison (including bison lasagna and bison meatballs). The portion sizes and taste at Padrino’s was top-notch and service was also great. Memphis BBQ Platter at Better Than Fred’s. We were recommended to Better Than Fred’s for their BBQ which is super smokey and flavourful. We shared the Memphis Platter (it was our second dinner, after Padrino’s!) 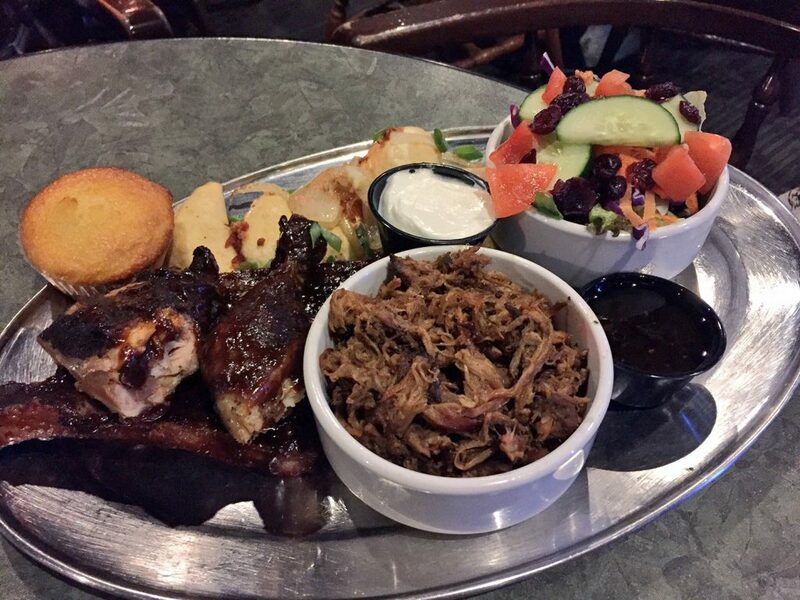 which featured ribs, chicken, and pulled pork, along with two sides and cornbread. The ribs were my favourite while Diane loved the pulled pork (I saved leftovers for Mike and he also really loved the pulled pork). Diane also dug the cornbread, which was a lot lighter than your typical cornbread, kind of like a corn muffin. Better Than Fred’s also typically has live music on the weekends but didn’t the night we went. If it had, the experience would’ve been that much better! And our last meal in Grande Prairie was at Soto Japanese – a Japanese/Teppanyaki/Fusion restaurant that puts out some super fresh sashimi and a seriously tasty selection of rolls. There’s a ton of chain restaurants in Grande Prairie but there are some fantastic, local gems that I recommend you try! Visiting Grande Prairie’s emblem – the Trumpeter Swan! I love taking photos of art and with art – especially if the art is of the ‘giant’ nature. Alberta’s got its fair share of giant statues and there are two right in Grande Prairie! 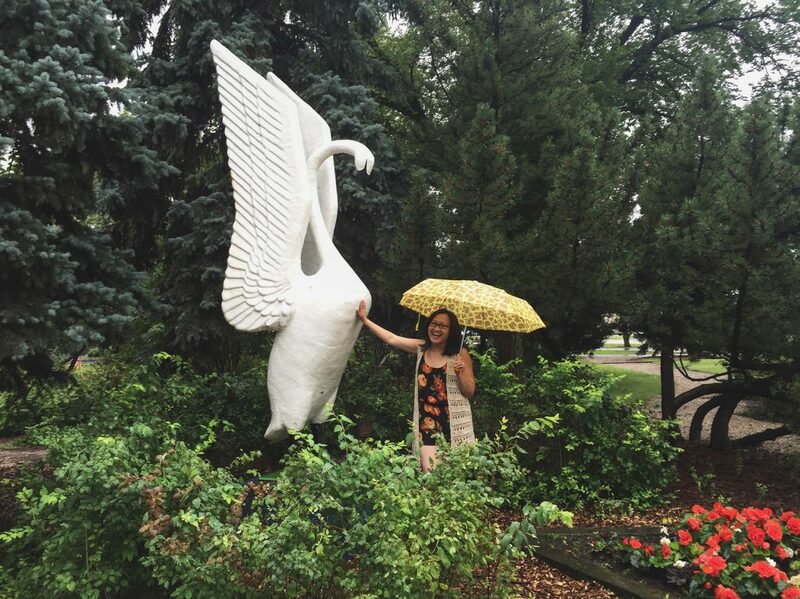 First we visited the GP Trumpeter Swan statue in Jubilee Park (which is on 103 Avenue and 100 Street). The Trumpeter Swan is the emblem of Grande Prairie – as (fun fact) – Grande Prairie is home to the largest flock of Trumpeter Swans in Canada! 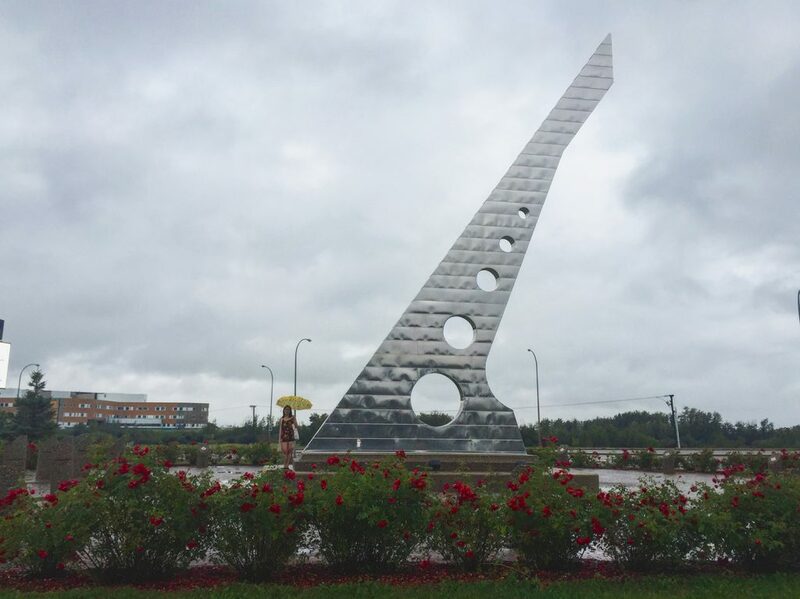 Cloudy during our visit to the giant Grande Prairie Sundial! We also stopped for photos with the giant Grande Prairie sundial. Standing at over 40-feet high, this impressive structure marks the passage of the Year 2000 (it was built as part of Grande Prairie’s millennium celebrations). Walks and Pokemon Training at Muskoseepi Park in Grande Prairie. 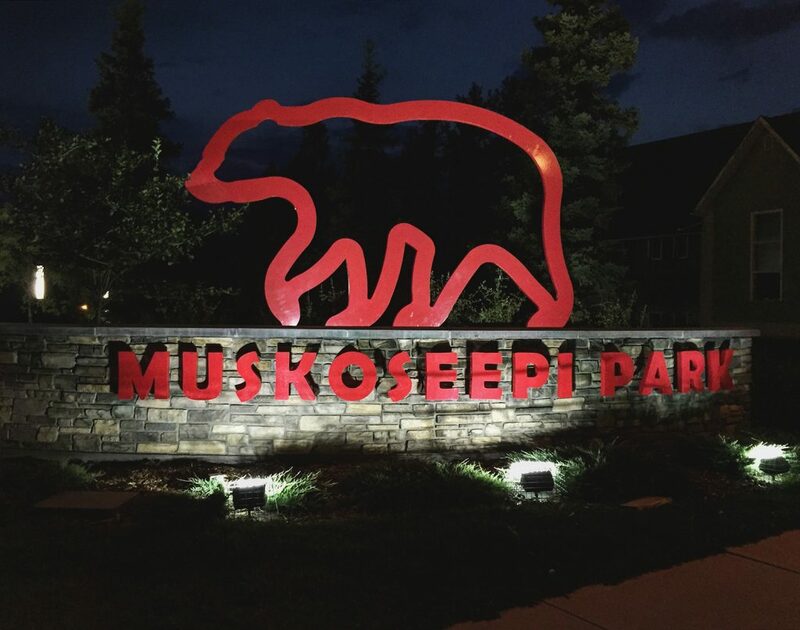 Bonus: We visited Muskoseepi Park too – to hunt Pokemon. At 11 p.m. on a Saturday night there must’ve been over a dozen people hanging out in the park! It was so great. Did you know – woolly mammoths roamed the Peace Country? 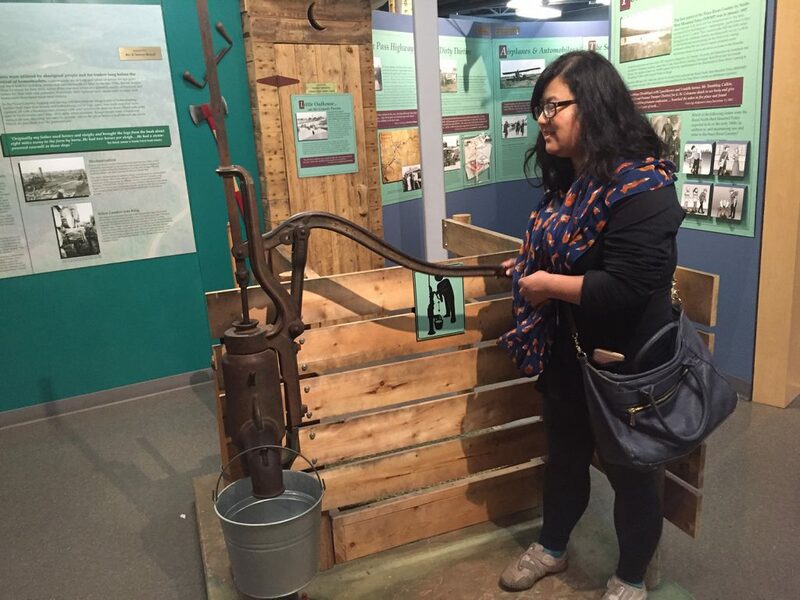 Learned this at the Grande Prairie Heritage Discovery Centre! Speaking of Pokemon… I caught some pretty awesome ones at the Grande Prairie Heritage Discovery Centre Museum too. 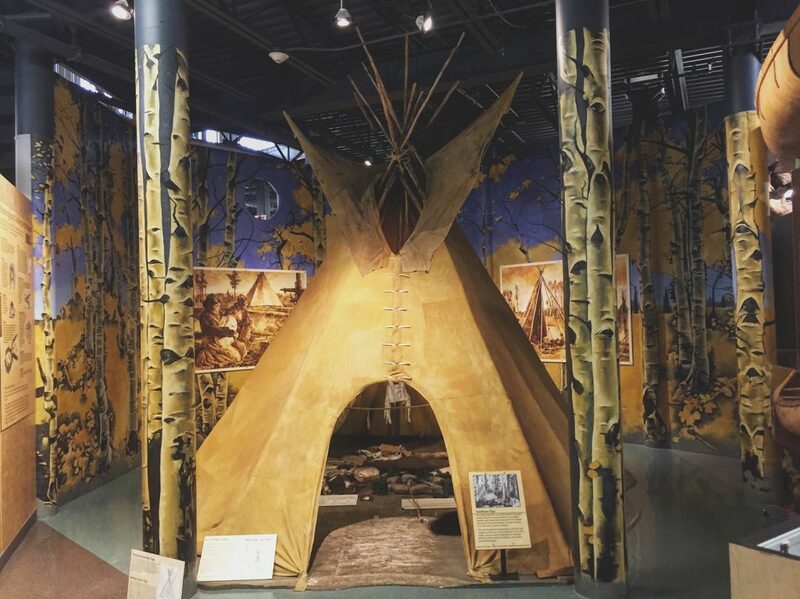 If that’s not incentive enough to visit, I’d recommend stopping here anyway as it’s free admission and you get to learn a lot about the Peace Country and Grande Prairie’s (you guessed it) heritage. At the Grande Prairie Heritage Discovery Centre. The exhibit ‘starts’ with the dinosaurs and moves in chronological order showing how the region and its people evolved to present day. Diane doing chores like the Grande Prairie pioneers used to. 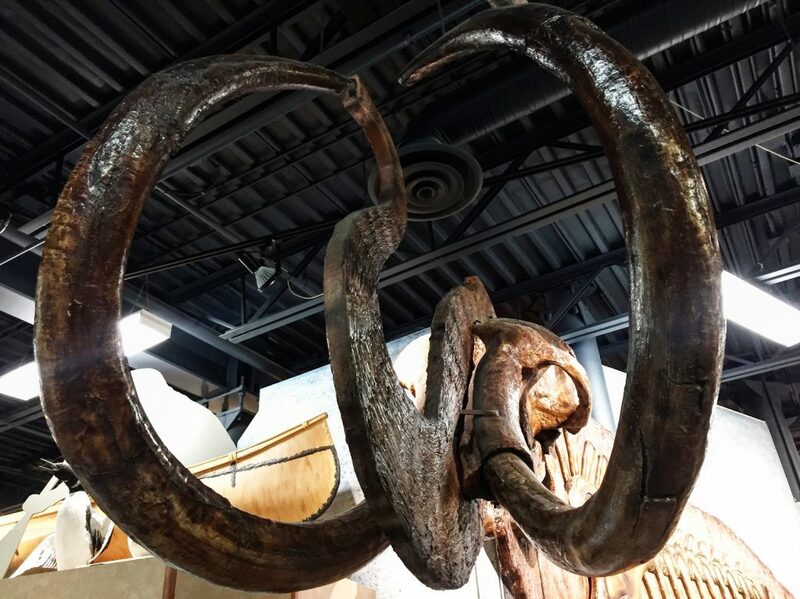 There’s a big dinosaur feature here as well (with an animatronic dinosaur named Piper that moves as you step near her) and we also learned the Woolly Mammoths once roamed Alberta – right in the Grande Prairie-area. Fun times were had at HJ’s 5-pin Bowling! 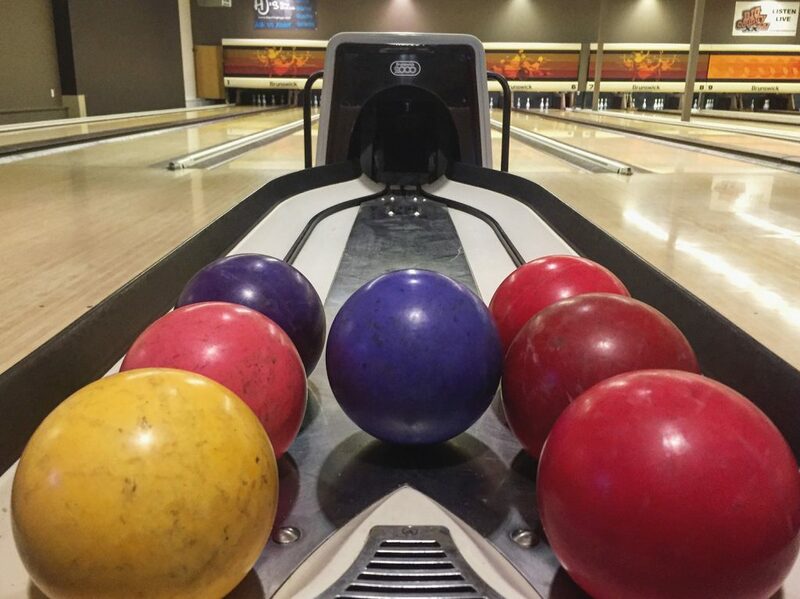 One thing I rarely do in Edmonton but should because it’s so much fun – is bowling! 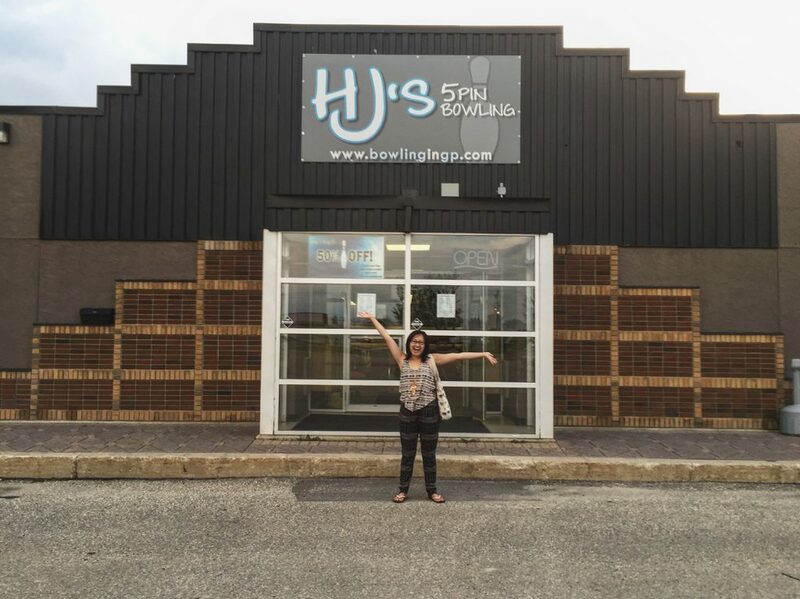 In Grande Prairie, HJ’s 5-pin Bowling is an awesome place to go for friends and families. We played three fun and highly competitive games (lasted about an hour and a half with just the two of us). HJ’s charges by lane/hour which is different than what I’m used to in Edmonton (which charges per person / hour). Usually it costs $45/lane/hour for up to 5 people, but in the summer, that price is 50% ($22.50/lane/hour) which is a fantastic deal! In the time we were there we saw a few different groups come in to play (couples, families, double dates). Fun night bowling at HJ’s 5-pin Bowling. The atmosphere was great and they have a cool electronic jukebox that has a great music selection. Owner Barry is also super nice and was encouraging us to join a league (even though I’m terrible lol). Note: AMA Members SAVE 20% on regular open play rates! Copious amounts of candy at Sticky’s Candy in Grande Prairie. Diane and I managed to squeeze in stops to some Grande Prairie shops like Sticky’s Candy and the Strange Ideas Comics & Collectibles. 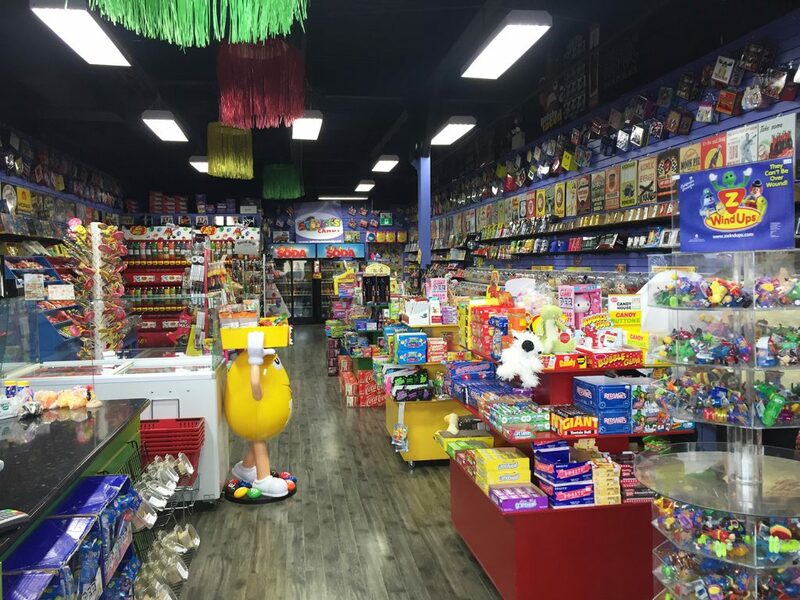 The Strange Ideas Comics & Collectibles has a huge board game selection (I almost went home with three…) and looks like just a nice place for people to stop in to browse comics and play some card games. They also have regular game nights too. 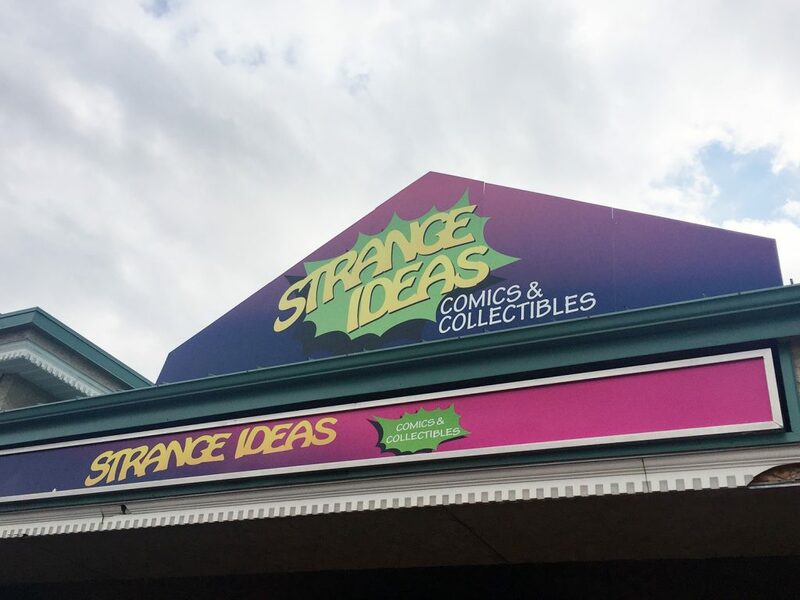 Strange Ideas Comics & Collectibles in Grande Prairie. One of the shop’s mandates is also to keep fair pricing, literally “why travel to Edmonton when we match or beat their prices anyway?” So you might some nice gems here for a better price. Driving through downtown (we think it was downtown) Grande Prairie, we also noticed lots of little interesting shops we wanted to stop into had we had more time! Lots to explore here. 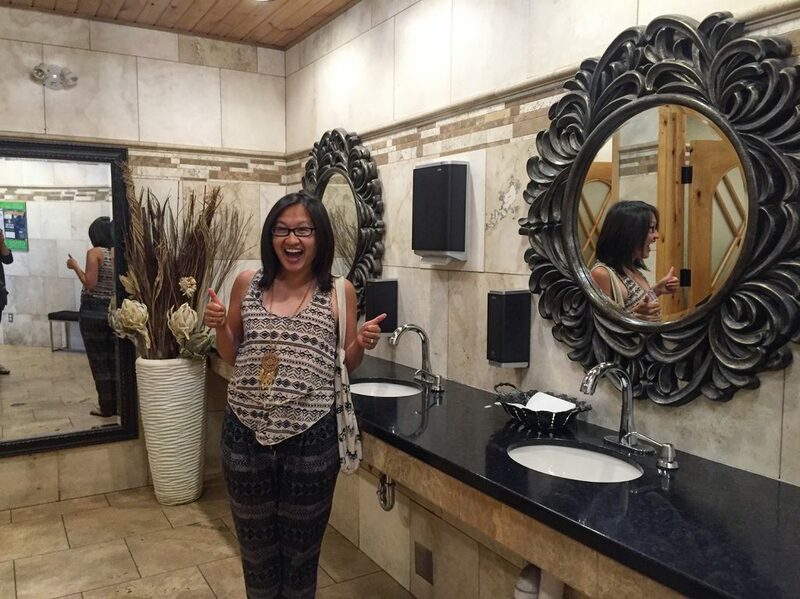 In Canada’s Best Restroom – Valleyview, Alberta! Did you know in 2013, the Shell gas station and convenience store restroom in Valleyview, Alberta, located on Highway 43 as you’re making your way to Grande Prairie, was named Canada’s Best Restroom? The restroom is pretty swank – with chandeliers, tile floor, soap inside the stalls, wooden stalls, ornate mirrors, and marble countertops. The convenience store itself is also really big and has a lot of food options too. The cutest little set-up at the Crooked Creek General Store. We had some great Twitter recommendations on some places to visit along Highway 43 including stopping at the Crooked Creek General Store for their famous donuts. 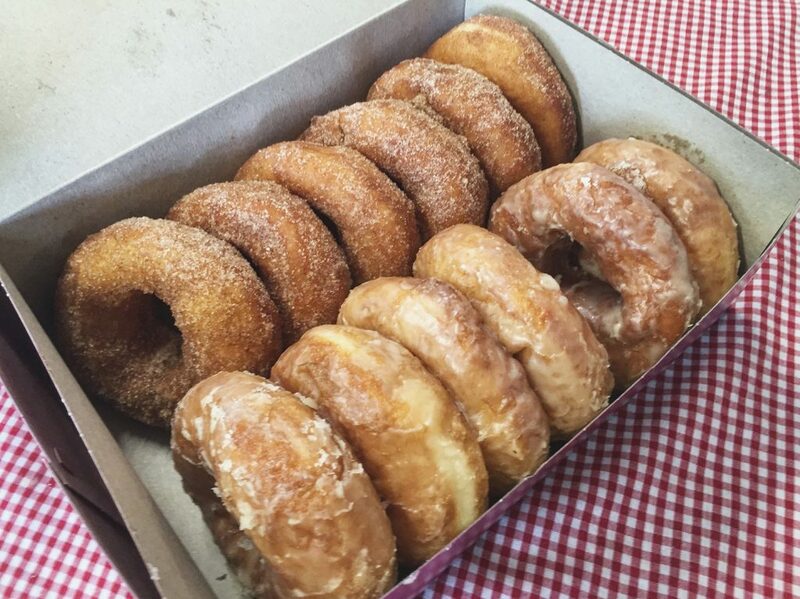 Apparently their donuts (cinnamon sugar or vanilla glaze) are getting so popular, CBC recently did a story on them! Donuts from Crooked Creek General Store. We thought these donuts were light and delicious (we both preferred the vanilla glaze) and definitely recommend them. Hopefully they add even more flavours! Also super cute, outside the Crooked Creek General Store is a burger shack and ice cream shop. Perfect pit stop to satisfy all cravings. Stopping at the Rochfort Bridge Trading Post Restaurant along Highway 43. 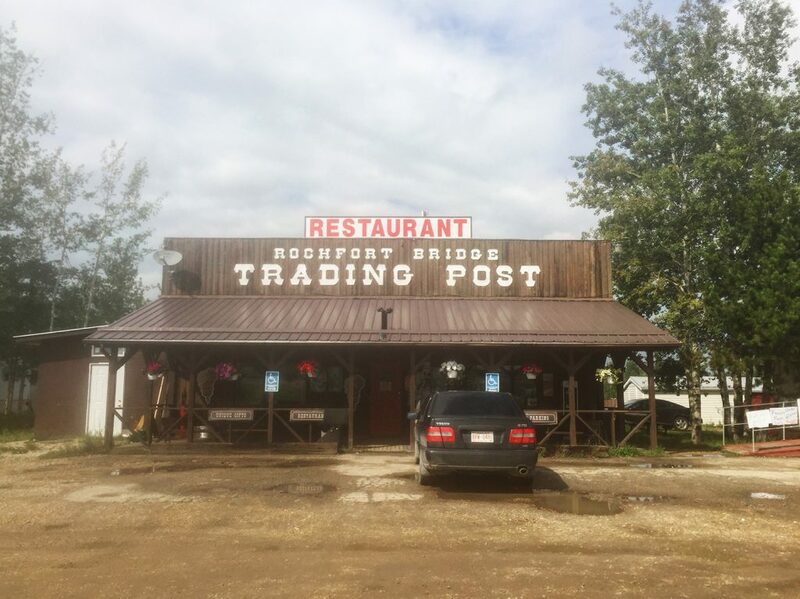 Another recommendation for a roadside stop was at the Rochfort Bridge Trading Post Restaurant, which is by the really cool-looking Rochfort Trestle Bridge. I had the mushroom burger and it was one of the best burgers I’ve ever had, seriously! 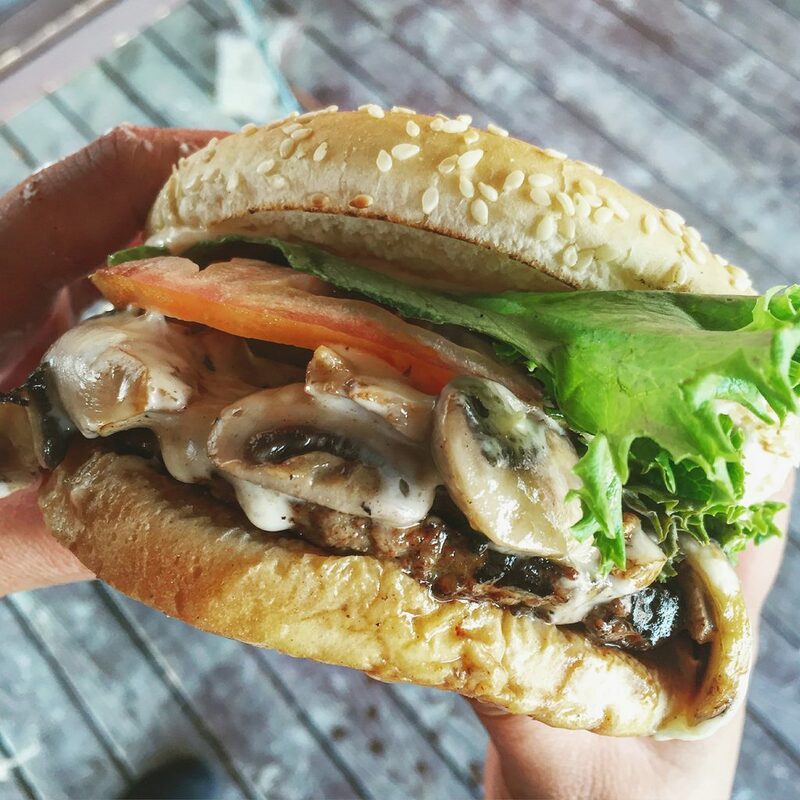 Delicious mushroom burger from Rochfort Bridge Trading Post Restaurant! I’m really finding Alberta countryside burgers to be some of the best ever (I also have fond burger memories from Ryley, Alberta). I’ve been told from a lot of people since that they’ve always driven by the Rochfort Bridge Trading Post but have never actually stopped in – you definitely should. 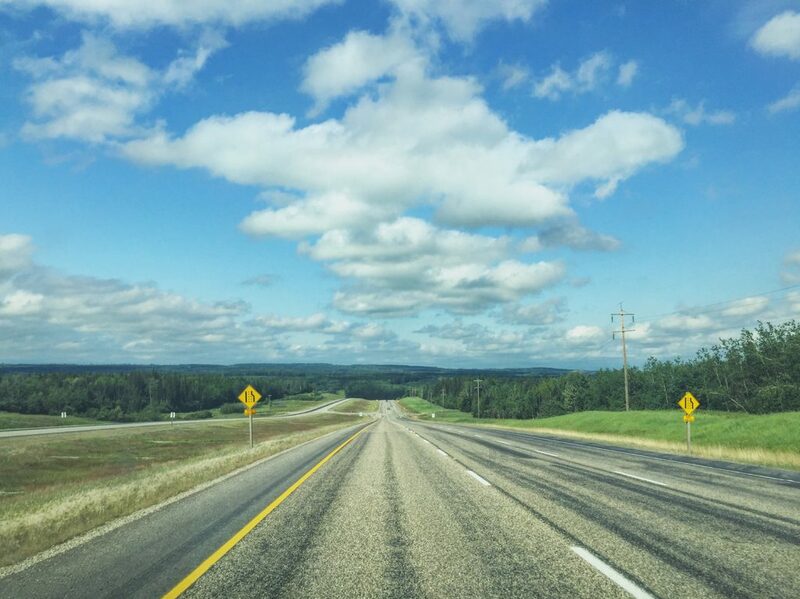 We didn’t do this – but one of the things we noticed on our drive to and from Grande Prairie was just how many provincial parks, rivers, creeks, forest-areas there were! You could even play a road trip game around counting all the creeks… lol, at least we tried. If you’re headed to Grande Prairie for longer than a weekend, you could do the whirlwind, in-town itinerary that Diane and I did, but also tack on a few extra days for some time in nature. BONUS: Visit the local craft breweries! Mike loves the GP Brewing Co. Hefeweizen. We discovered Grande Prairie is home to the GP Brewing Co. as well as Grain Bin Brewing – two local, northern Alberta craft breweries. 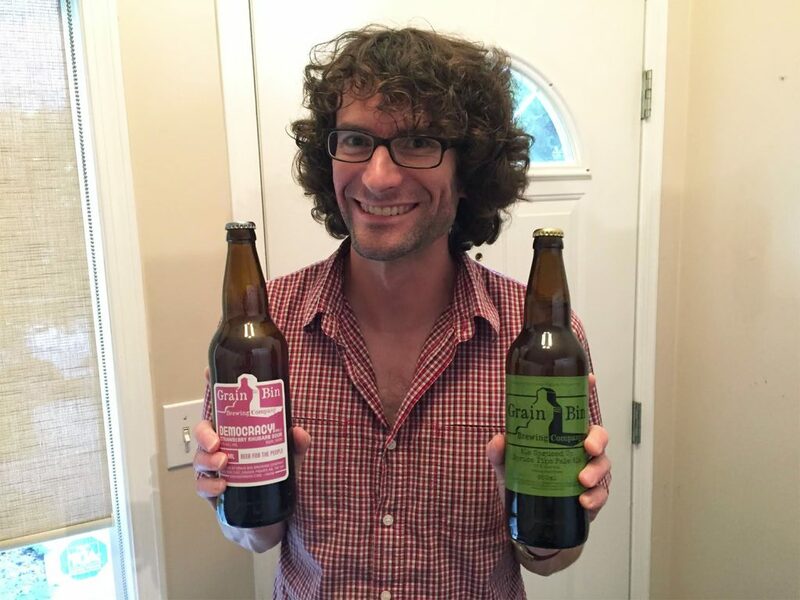 As a good wife and a good friend, I brought home a six-pack of mixed beers from GP Brewing Co. for Mike, and two bottles of Grain Bin for my friend Scott! 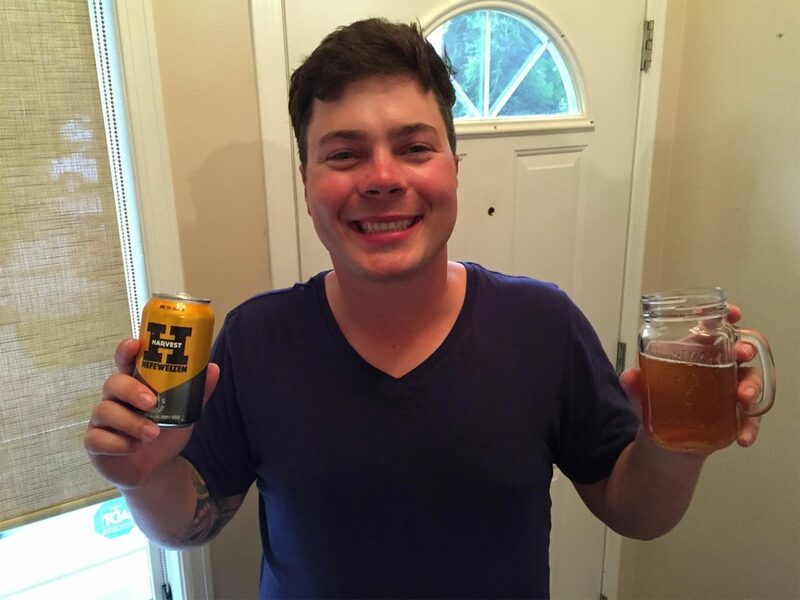 Scott is on a mission to only drink Alberta Beer for One Year! I helped! He has already tried GP Brewing Co. (you can actually buy it in Edmonton from Sherbrooke Liquor) so was eager to try Grain Bin. Watch his blog for his review! Overall, Diane and I had a fantastic weekend road trip to Grande Prairie. I really can’t stress how pleased we were with the quality and variety of food options. The museum was so interesting, bowling was a lot of fun, and visiting the different shops and walking through the parks was lovely. It’s really not *that* far from Edmonton, and I thought the drive along Highway 43 is really interesting – with lots of hills, valleys, and tons of trees! Interested in your own Grande Prairie getaway? I’m excited to give away 1 family pass to the Philip J. Currie Dinosaur Museum, 1 pass for 5 free games to HJ’s 5-pin Bowling for a group of up to 5 people, and a $50 Esso gas gift card. Note: AMA members can EARN 2% back in reward dollars whenever they reload their Esso cards. ENTER TO WIN A GRANDE PRAIRIE #THEROADISCALLING PRIZE PACK! 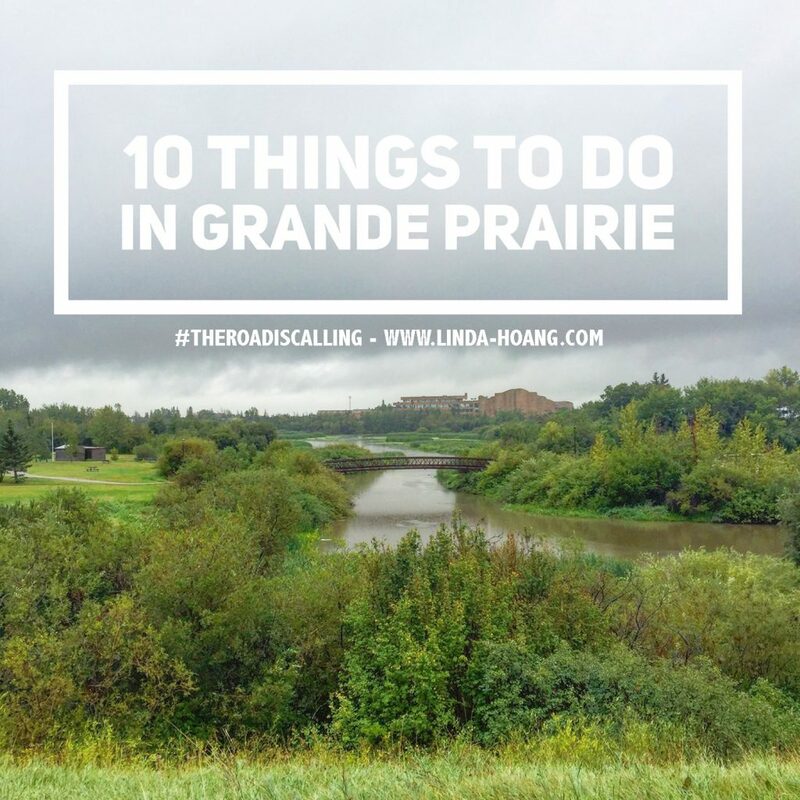 Leave a comment on this blog post telling me what you’d most like to do in Grande Prairie! Note: You MUST leave a comment in order to be eligible for the prize! All other ways to enter will get you additional/bonus entries and improve your chances of winning, but you won’t be eligible unless you leave a blog comment first. Note: Comments are moderated so if yours doesn’t appear right away, don’t worry! Also: if the Rafflectoper widget does not load, please let me know what entries you did in the comments. ** UPDATE ** Congratulations to Dominic C., who was randomly selected as the winner of this contest! Disclaimer: This post was sponsored by the Alberta Motor Association, as part of AMA’s “The Road is Calling” summer campaign. Your AMA Membership can save you – whether you need roadside assistance, to book a vacation or at one of our Rewards partners. AMA is also having an awesome summer road trip contest as part of this campaign, where you could win an escorted journey through Ireland (a $9,000 value)! Check out ama.ab.ca/theroadiscalling to enter the contest, and see the adventures other bloggers went on! I want to visit the Crooked Creek General Store!! My in-laws live in Grand Prairie, but we’ve only ever done quick weekend trips to visit them, so I’ve never really explore GP. This made me excited for our trip in a couple of weeks! I’m definitely going to go check out the farmer’s market and try some tacos! I really want to visit the dinosaur museum. Anytime I go to GP, I’m always on business and haven’t had a chance to see this yet. I’d like to visit my cousins who I haven’t seen in about 15 years! 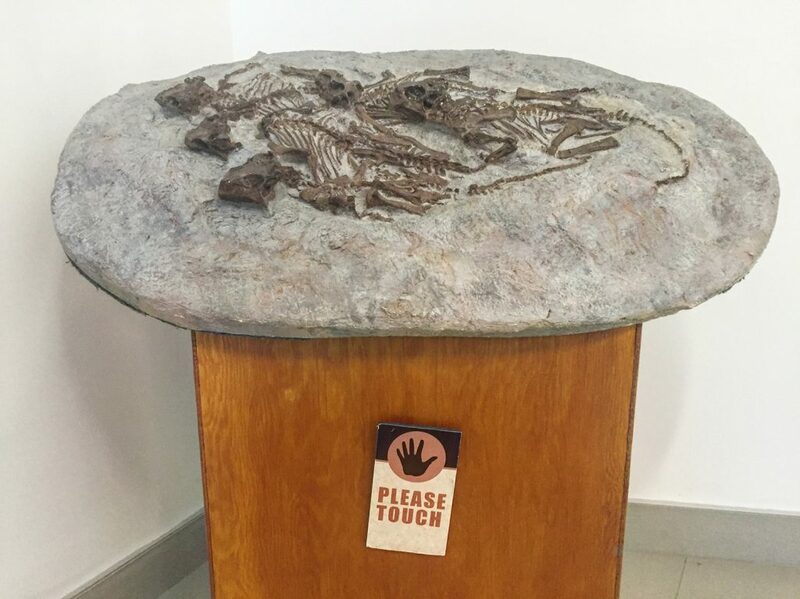 Take my kids to the dinosaur museum! I’d like to go the the dinosaur museum! Eating a Donut from Crooked Creek General Store! I have been to Grande Prairie several times and did not know of the interesting places to visit and eat. Thank you. I will go again to see them now. I haven’t been to Grand Prairie in about 25 years. Time for a road trip, me thinks. Great pics! I have just read ‘In Search of Ancient Alberta’ which I purchased with my AMA discount at the Royal Tyrrell Museum’ in Drumheller earlier this month and we definitely want to visit the Philip J. Currie Dinosaur Museum. You made Grande Prairie and area sound just so exciting. We visit there often on farm business but it’s time we looked at the area through the eyes of a tourist! I love Keddies Western Store and H & M Meats where you can buy Bison Jerky, Pepperoni and other cuts of fresh bison! Oh yes, and Crooked Creek really does have ‘to die for’ donuts and cinnamon buns!